Not a big deal, but I’d hazard quite a few people get that challenge as the checkbox appears after the flow from headline to bullets to main CTA. I should also mention that whenever I see a challenge like this the site I’m visiting always loses a little bit of my “visitor equity”. 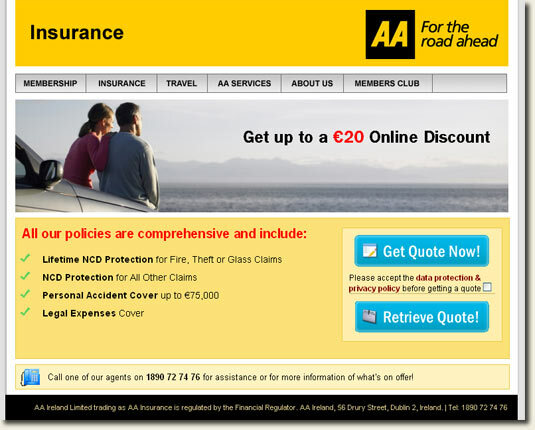 I’ve written before about a very similar type of negative assurance – negative point of action assurances – which coincidentally was also based on an Irish insurance website. This is just Step 1? And I don’t even get my quote until Step 4. What strikes you when you look at the form? What strikes me very quickly is that the AA expects me to invest a lot of time, and a whole lot of commitment, without indicating my benefit from this transaction. The progress indicator tells me I wont see a quote until Step 4, and I’m getting very cold feet at step 1. The incredible T&Cs that you must accept before the AA asks you to commit God-knows how much time and energy to see a potentially crap quote. When confronted with the AA’s long (unnecessary?) form I managed just 2 fields before bailing. Yep it took just 2 fields to decide that the perceived benefits of this interaction fell massively short of the commitment required. The AA doesn’t need all this data to price the premium, and my “visitor’s mind” now wonders how trustworthy this transaction actually is. Do you trust a company that insists on capturing everything about you without explicitly offering something in return? Will you commit to a transaction before you know what benefit you’ll derive from the transaction? Probably not. The final nail in the coffin is the onerous legal T&Cs that users must accept before they can even view Step 1. This is what I “hear” – this transaction is all about us, about our terms and conditions, about our lead system, and about us pushing a sale on you later. That perception might be misplaced, but since there’s no way in hell I’m going to read those T&Cs my next interaction will likely be with a competitor who thinks about me the customer. After all he’s only a click away. So How Do You Nurture Your Insurance Leads? Will FBD get my custom? Maybe, but one thing is for sure – The AA smothered me long before I came close to becoming a lead. I work for an online insurance broker and we’re very familiar with the issues that you raise. Everything you say about putting users off is true. However, one of the challenges to designing a good quote workflow is that insurers require detailed information about the risk before they can provide an _accurate_ quote that they can stand over. Despite initial appearances, even FBD needs to gather this detailed information. The first FBD quote that you see, based on only a few fields, is a ‘ball park’ figure. For an accurate quote, which let’s face it is what everyone customer wants when seeking the best deal, you need to provide more information in subsequent steps – the final quote will likely not be what you were quoted initially. Also, after you’ve invested the time to provide the necessary detail, the system can decide to take the quote ‘offline’ by requesting that you call FBD to discuss your needs. While I agree that there’s a lot that can be done to prevent putting the customer off, there are limits to what can be done with an insurance quotation site. There will always be a compromise between the level of detail required to get a quote and accuracy of the quote. FBD have done a better job than most, but you’d have to question the usefulness of a quote that will most likely change once the full information is known. So true. It’s obvious that these websites (AA, Quinn, etc) are developed with the company’s internal business process in mind rather than the customer. 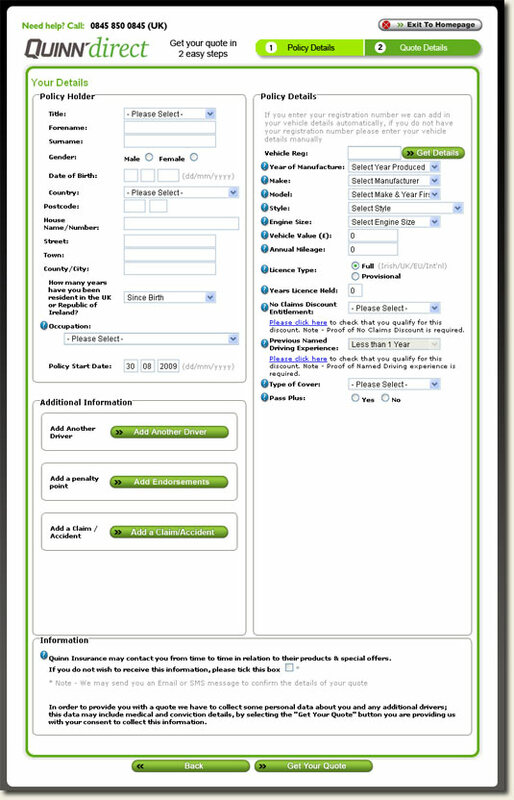 I’ve also found FBD and another of their sites http://www.nononsense.ie/ refreshingly easy to use. As as aside, when I’m shopping around for car insurance I never give my correct personal details to these websites. I use bogus a name, dob and address (although the dob and address will be close to my own so the underwriting isn’t adversely effected). It’s my way of protesting at the amount of personal information these companies require just to give you a quick quote. Thanks for your comment. I’m in total agreement with you re FBD – they seem to have a user-centric design process which works well, and I’m fairly sure reaps dividends for them. The workflow for FBD, even beyond the ballpark quote is very light weight. 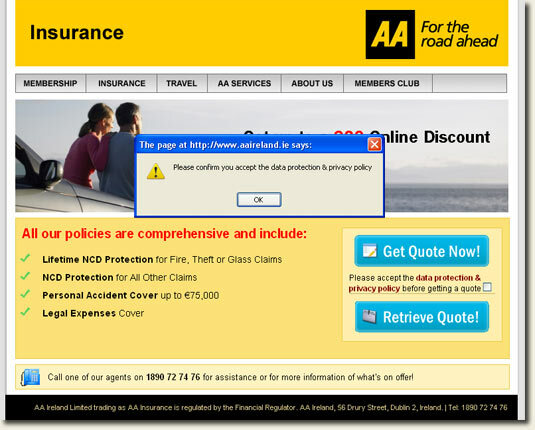 I managed to get my full quote without entering half of the info required by the AA. And their workflow was absolutely built around me, not their marketing and quote systems. I called the AA this morning, and they collected nearly as much on the phone. They wanted my current provider info to generate the quote. How that could be required, other than for them to vary the premium I cant tell. But the main point I’m trying to make here is that you, as an insurance website, have to give me, as a potential client, enough perceived benefit to justify my commitment. The more barriers you put in front of me (longer form, more steps, no quote before giving my life details) the more benefit you have to offer me. FBD seem to have cracked this by keeping their quote engine light, and offering me a teaser quote very early on to keep my interest. The AA killed me long before I even got the quote. I moved to FBD 2 months ago for exactly this reason. 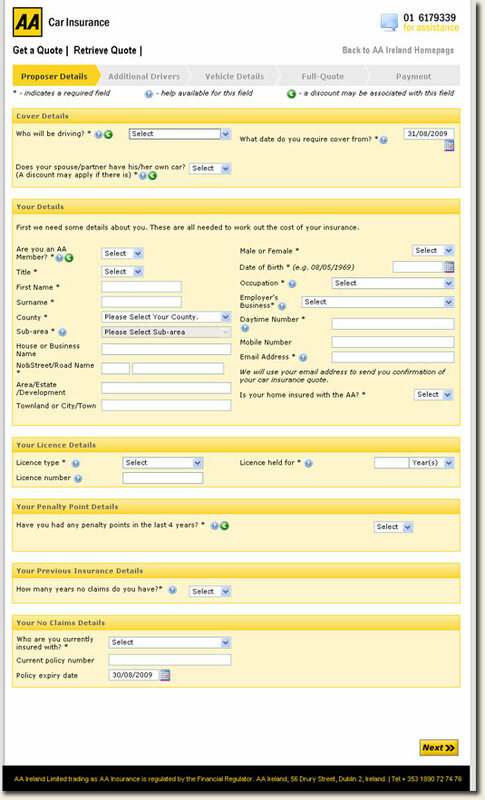 I hate filling out loads and loads of forms just to get a quote. There no frills approach is the way forward and I’m surprised others have not caught onto it yet. Good to see you last week, and just a shame we didn’t get time to shoot the breeze. I’ve chatted with quite a couple of companies in this space, and the one theme I see throughout is an old-school marketing mentality – fitting the square peg into the round hole. Q. How many insurance sites run blogs? Q. How many update their web content? Q. How many build content around users? Q. How many are using the web to build interactions, e.g. twitter and web out-reach? Q. How many have user-centric design philosophy? List goes on, and FBD are the example I use of a company that’s progressive with their online marketing strategy. Hopefully catch you again soon. I’m like you; I get to about step two of these things and bail. But I don’t just bail, I bail muttering “F**k off, you stupid XYZ company…”. It’s bad enough losing the prospect, but sending them off cursing you is infinitely worse again. Thanks for dropping by and commenting. I think we’re both in agreement that a lot of companies still don’t “get” the web. But that’s actually good news as it means there’s still plenty of opportunity out there. Yikes, that’s a scary looking form. And there are 4 more pages to it! When you see the form in its entirety like you’ve shown it, it really is clear that they’re doing something wrong. As an insurance executive I must stress that online companies do provide customers with extremely lengthy forms, however such questions are absolutely essential if you want to get the correct quotation. Insurance should not be purchased only based on the cost but on the quality of the policy. A lot of people seem to forget this. When you purchase insurance online you have very little standing if there is a claim. This is when you most need your insurance and a lot of online customers find themselves being told by the uninterested call centre workers that they do not have the correct cover and wont receive any compensation. I suggest that people do not disregard the idea of going to a broker, they deal with all insurance companies and in the event of a claim they will fight on your behalf to get you the correct amount of compensation. You will be provided with the best insurance to suit your needs and if you have any questions you can deal with a person face to face, not someone in a call centre who doesnt know the first thing about insurance. 1. “…online companies do provide customers with extremely lengthy forms, however such questions are absolutely essential if you want to get the correct quotation.” – hopefully my post makes clear that online psychology is quite different to offline. If I call you it’s more difficult for me to bail from a human interaction, but if I go online I don’t give a hoot about your server being offended if I “put down the phone”. The basic premise of my post is that insurance companies have to learn how people “think” online. Would you not agree that FBD had a far more appealing funnel than either of the other 2 subject sites? 2. “Insurance should not be purchased only based on the cost but on the quality of the policy.” – IMO the insurance industry as a whole makes every effort to obfuscate cover terms in extremely long-winded T&Cs. Consumers are not likely to read these, so how do you think the insurance industry could help with more consumer-friendly documentation? 3. “When you purchase insurance online you have very little standing if there is a claim.” – are you suggesting that products sold online are purposely contrived to offer less cover? I do value the service offered by brokers, but I also imagine that unless you have a lawyer read through the T&Cs of any policy there’s every chance your coverage is less than expected whether purchased online or off (this also comes back to crazy T&Cs for consumer products). Thanks for commenting – I absolutely appreciate the views of someone looking out.